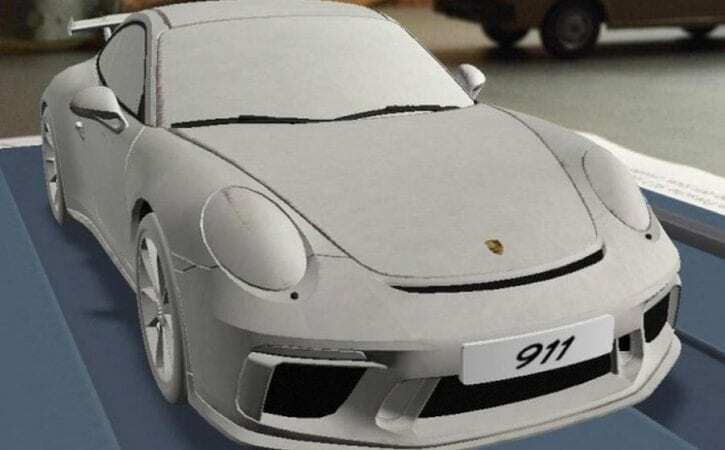 The Porsche 911 GT3’s design has leaked in a series of images. Revealing the full design of the car from multiple angles, the images first surfaced on a Dutch blog after being discovered by a reader. The pictures show a revised front end, with more aggressive air intakes in the front bumper, along with a new diffuser at the rear. Porsche, as is often the case with pre-release images of its products, would not confirm the authenticity of the images, but the images appear to show the same design tweaks as the prototype GT3 we’ve seen in spy shots. The 911 GT3 was also spied testing during development, showing a subtly refreshed front-end. The test mule wore very little disguise, so it’s clear to see that the deep, redesigned front spoiler, air intakes and new LED indicators are the only things to change, with the rest of the car’s styling carried over from the current model, including the slit grilles at the front and back, large rear wing and central twin exhausts. The 911 GT3’s manual-only, driver dynamics-focused sibling, the 911 R, was revealed at the Geneva motor show, where it was also revealed by GT3 guru Andreas Preuninger that the facelifted 911 GT3 would gain the option of a six-speed manual gearbox when it goes on sale in 2017. The test mule was also running on what appear to be new wheels with a multi-spoke design. However, the closely related 911 R still uses the same alloys as the outgoing GT3. Despite the rest of the 911 range now being turbocharged for added efficiency and reduced emissions, the facelifted car will maintain the naturally aspirated 3.8-litre engine of the current generation GT3. The current 911 GT3 pumps out 468bhp and 324lb ft which, combined with its 1430kg kerb weight, equates to a 0-62mph sprint of just 3.5sec and a top speed of 196mph. Porsche couldn’t give any further details on the upcoming 911 range-topper, but we do know that the 911 R will share its manual gearbox with the 911 GT3.